The Wedding Reader Awards return for the third year, in what promises to be the biggest and most prestigious event of the wedding calendar. There are 19 categories in wedding Reader Awards 2014 and now that the finalists have been revealed, it’s time to vote for your winner.What i need you to do is vote for mayo wedding Dj Tommy Elliott in the ‘Music/Entertainment’ category. Each vote really does count, so get voting for me if you would like to see me named ‘best in my class’ at an exclusive industry event on the 9th June at the Malone Lodge Hotel, Belfast so i would ask everyone to take a few minutes and click the link below. Dj Tommy Elliott has been nominated in the Music/Entertainer section of the awards. 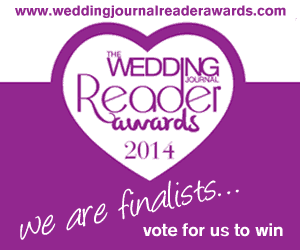 Its a great privilege to be nominated in the same category as some of the top wedding suppliers in Ireland. When you play at a couples wedding its great to be part of a very special occasion which they and hopefully their guests will remember for a long time to come. Being nominated for this award is very important to me as this is the ONLY wedding awards in Ireland where it’s possible to get nominated simply by previous customer votes. I didn’t enter the competition…I was voted in by my customers!You only get one shot at choosing the right DJ for your wedding. Did i play at your wedding? Have you booked me to play at your wedding? Are you thinking about booking me to play at your wedding? IF SO THEN PLEASE VOTE FOR me! Its a show of your support for the local wedding industry by voting for those businesses and personalities that go beyond the call of duty, providing a five star wedding service that’s second to none.